Earlier this week, my contract with the personal trainer ran out. I had been seeing him once a week for a thirty minute session since late last year. Anyhow, I have signed up again with him to do two forty-five minute sessions a week and I just completed the first one about half an hour ago. I was initially in a world of hurt, but am feeling fine right now, although I expect to be sore tomorrow and Sunday. Apart from last week when I was away visiting the folks and the week before that when I had viral gastro, I have been going to the gym just about every day and I can now comfortably do a hour of cardio. Yesterday, I did an hour and a quarter and could have done more, but I had some things to do. I could not imagine doing that eight months ago, when climbing the stairs at work left me sweating and gasping. This has been the primary goal - getting fitter and feeling better. I have totally changed my diet as well, and am eating salads, lean meats and many more good things. Can't wait for the price of bananas to go down again. When I want something sweet for a snack, I have the little boxes of Sunbeam apricot and sultanas. However, my one main vice remains my regular Diet Coke. The family complains that I shouldn't be drinking it, but at this point, I tell them that I've given up just about everything else; please grant me this one small thing. At the end of my contract, Ben put me on the scales. While I have asked him not to tell me my weight as I was concerned at the beginning that tracking numbers would be a discouragement, he did tell me that I have lost around 25 kilograms since I began in September last year. In addition, I have lost a few inches around the middle. 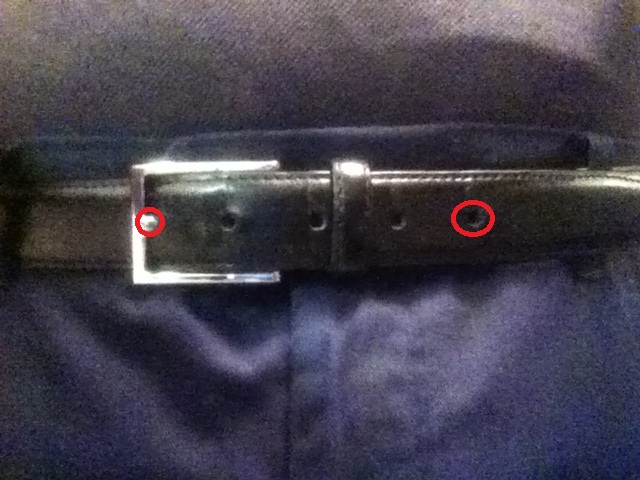 Below is a picture of the belt I bought last year. The old one it replaced had an extra hole added near the end. I am now at the point where I may be in the market for a smaller belt. Perhaps I should switch to braces until I stop losing inches? I have gone from a 137 waist to 122, and from a 52 neck to a 47. I went to the Apex Club changeover and I could actually do up the button on my suit jacket, which I haven't been able to do in years. I still have a way to go, but I like to think I am on track. I certainly feel a lot better lately. Being on long service leave certainly helps as I have plenty of time and no excuses, but I would like to think that when I return to a job that I will keep up what I have done. But my biggest pieces of advice in losing weight are, firstly, to not worry about the numbers and second, know that it is going to hurt, and as much as you want to curse the trainer unto the seventh generation at the time, it is worth it in the long run. All I can say is wow. I hope you keep up the good work and am glad that you feel it's been worth it. Amazing work! Now Shaun and I have to start getting motivated. Since moving to Alice, we've been a bit lazy.